The awful performance at General Motors -- down 45% from September 2008. Ford's tiny decline of only 6% from a year ago, despite the end of the Cash For Clunkers program in August. No other major maker had a year-over-year September decline that was even half of that seen at GM or Chrysler. Yet the press, while beginning to acknowledge serious problems at the companies, both of which were first bailed out by the government and then taken through government-orchestrated, contract law-violating, UAW-favoring bankruptcies (GM discussed here, Chrysler here), still will not entertain the possibility, despite the evidence, that consumers are shunning them because of their bailed-out status and their heavy-handed tactics in bankruptcy. What follows are excerpts from three reports that covered September's industry results. A Cash for Clunkers hangover hit every major automaker except Hyundai last month, pushing down sales and leaving the industry searching for signs of a recovery in October. U.S. sales of cars and light trucks fell to just under 746,000 in September, down 41 percent from August. Both GM and Chrysler were the biggest losers last month, while Ford, the healthiest of the Detroit Three, reported the smallest drop of major automakers. Of the top companies, only Hyundai posted higher sales, up 27 percent from September 2008. .... General Motors Co.'s sales plunged 45 percent while Chrysler Group LLC's fell 42 percent. The weak results continued a string of monthly sales drops for the troubled pair. Now the question is whether their government-funded recovery plans are working. .... A spokeswoman for the U.S. Treasury Department, which has provided roughly $65 billion to keep GM and Chrysler going, would not comment on the sales figures. Including equity that was in effect expropriated from the two companies' disfavored lenders, the total amount of aid provided to GM and Chrysler is significantly higher than the already huge figure the AP pair cited. Sales in September 2008 were rocked by the collapse of Lehman Brothers and the financial crisis, events that pushed both GM and Chrysler to seek a federal bailout. With consumer uncertainty rising, sales in September a year earlier had dropped to a 12.2 million unit rate. .... "In the short term, I don't see much of change for GM and Chrysler in terms of sales declines. The No. 1 reason really is their product lineup," said Jesse Toprak, an analyst at Truecar.com. "The bigger question is whether they can restructure themselves to make money at lower sales levels -- it's going to be tough, obviously," he said. Fiat SpA Chief Executive Sergio Marchionne, who has taken charge of Chrysler's turnaround plan after the Italian automaker took management control at the U.S. automaker, said reduced incentive spending had contributed to the depressed sales result for September. "We are not bleeding like people think we are," Marchionne told reporters. .... GM said it was sticking with plans to increase production in North America by 20 percent in the fourth quarter compared with the third quarter. .... "Clearly, the economy is starting to gain some momentum," said GM sales analyst Mike DiGiovanni. "But we know it's still going to be bumpy and clearly the economy is still dependent on policy stimulus." That would be the same "policy stimulus" that Noel Sheppard at NewsBusters noted earlier today was the subject of derisive laughter from CNBC's Melissa Francis and Lawrence Kudlow when Former Clinton Labor Secretary and current Obama economic advisor Robert Reich tried to claim that "the stimulus package is the thing that is actually keeping the economy up, keeping people employed." As to "restructuring to make money at lower sales leves" -- uh, I thought that's among the reasons they went through bankruptcies. Only a few months out, they have to restructure yet again if they're ever going to make money? .... At G.M., which is eliminating four of its eight brands as part of its postbankruptcy restructuring, sales for the four brands that will remain — Buick, Cadillac, Chevrolet and GMC — were down 41 percent in September. The big story in vehicle sales ever since the bailouts of GM and Chrysler commenced in December of last year has been how those two companies have consistently lost market share ever since. 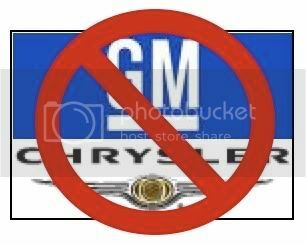 The press has almost dogmatically refused to consider the possibility that consumers continue to shun now state-controlled GM and shotgun-wedded Chrysler because they refuse to do business with bailed-out companies that gobbled up tens of billions of dollars of taxpayer money, running roughshod over disfavored classes of creditors and violating long-established principles of contract law in the process. Even if the avoidance in some cases isn't ideologically based, but instead revolves around warranty and other concerns, lost sales are lost sales. One has to wonder why the government and its car czars and onsite management at the two companies have never entertained the idea that a backlash might occur, and why it never tried to do anything about it once its presence was apparent in the marketplace. It may be that the establishment media's refusal to take the shunning seriously is contributing to their complacency. If so, they are not doing the companies any favors.